Historical breadth datafiles on 200 major stock indexes and all US traded ETFs in .csv format. The charts and indicators displayed below can be created in Excel or any charting software utilizing the downloaded .csv formatted files. They are provided here to suggest possibilities for your own charts and analyses. Starting at 0 (zero) accumulate the difference between advancing issues minus declining issues within the composite Overview: The Advance/Decline Line ("A/D Line") is undoubtedly the most widely used measure of market breadth. It is a cumulative total of the Advancing-Declining Issues indicator. When compared to the movement of a market index (e.g., Dow Jones Industrials, S&P 500, etc) the A/D Line has proven to be an effective gauge of the stock market's strength. The A/D Line is helpful when measuring overall market strength. When more stocks are advancing than declining, the A/D Line moves up (and vice versa). Many investors feel that the A/D Line shows market strength better than more commonly used indices such as the Dow Jones Industrial Average ("DJIA") or the S&P 500 Index. By studying the trend of the A/D Line you can see if the market is in a rising or falling trend, if the trend is still intact, and how long the current trend has prevailed. 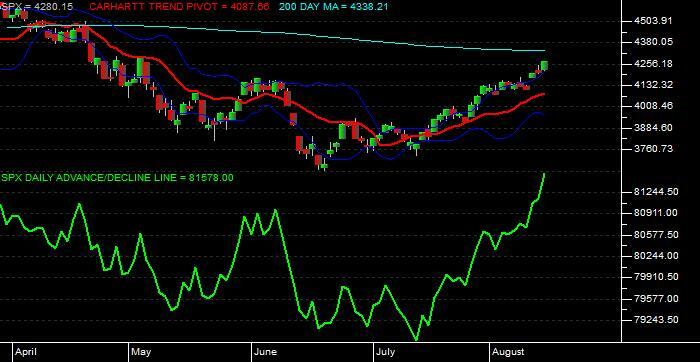 Another way to use the A/D Line is to look for a divergence between the DJIA (or a similar index) and the A/D Line. Often, an end to a bull market can be forecast when the A/D Line begins to round over while the DJIA is still trying to make new highs. Historically, when a divergence develops between the DJIA and the A/D Line, the DJIA has corrected and gone the direction of the A/D Line. A military analogy is often used when discussing the relationship between the A/D Line and the DJIA. The analogy is that trouble looms when the generals lead (e.g., the DJIA is making new highs) and the troops refuse to follow (e.g., the A/D Line fails to make new highs). To review MasterDATA's Privacy Statement, click here. Disclaimer: This material is for your private information. We are not soliciting any action based upon it. Opinions expressed are present opinions only. The material is based upon information considered reliable, but we do not represent that is accurate or complete, and it should not be relied upon as such. We, or persons involved in the preparation or issuance of this material may, from time to time, have long or short positions in, and buy or sell the securities or options of companies mentioned herein.